Exciting interactive play system SportACTIV was officially opened on 6 August in Ryetop Park, Rainham. 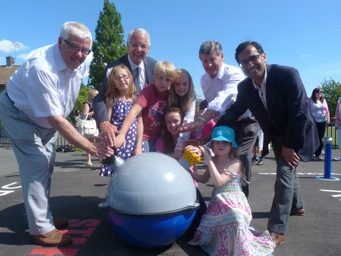 The play equipment – the first to be installed in Kent – aims to help children and young people be more active. More than 25 children turned up at the park in Beacon Close, Rainham to try their hand at the games. Sister and brother Megan Wyrill (12) and Ethan Wyrill (10) were some of the first to try out the new play system. Megan said: “You have to hit as many coloured lights as possible in 30 seconds, and work as a team. We like it because it’s computerised and it’s fun, fast and gets you really active. It’s a good way for children to get more fit and healthy.” Five games can be played on the equipment, and smart phone users are able to scan a QR code to give them a demonstration of the different games. SportACTIV is ideal to develop the user’s agility, balance and co-ordination skill, as well as general fitness, health and well-being. SportACTIV was declared officially opened by Medway Council’s Portfolio Holder for Community Services Cllr Howard Doe.